Heals digestive system, helps to normalize liver function and thereby support digestion. Combats depression and enhances mood. Helps to increase T-lymphocytes which play a major role in immunity. Helps to build immunity to fight infections like cold, cough, fever at every weather change and allergies. 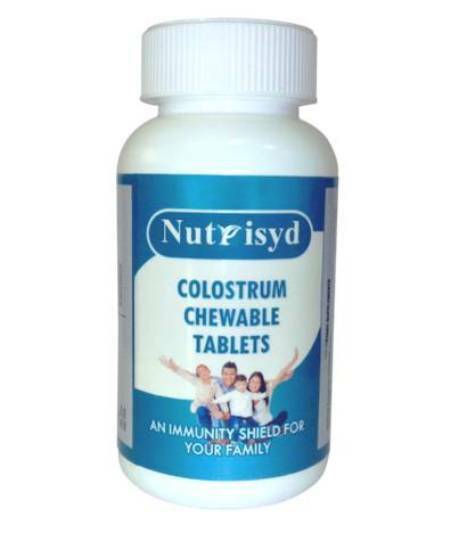 Colostrum provides naturally occurring vitamins and minerals. Colostrum supports growth and repair of cells and tissues. Prevents intestinal infections and enhances intestinal tract activity. Prevents diarrhea and reduces frequency of stool. May regulate blood sugar and cholesterol level. Uplifts the immunity which prolongs healthy and long life. Pack Size: 120 tablets in a HDPE Bottle. (American Ice Cream Flavour).